One of the basic questions in writing history is how to define the period under examination. Sometimes historians use seminal events- particularly military ones- as markers. Others use famous people: “the age of Beethoven” or “Austen’s world”. Centuries can be used as markers, stretched out to form “the long 18th century” or “the long 19th century”. A recent approach, reflecting no doubt the effect of sociology on history, has been to look at generations. My own research takes an individual life as its starting point: that of John Walpole Willis, born in 1793. I’ve been interested in some time in the mental furniture with which his mind would have been stocked, having grown to adulthood in pre-Victorian times, yet living most of his professional life under Victoria’s reign. As a judge, his pronouncements from the bench seem steeped in Victorian rectitude, but he was himself born in Georgian times. Using the British royal family as periodization (Georgian, Victorian) is convenient, but it doesn’t explain how any qualitative change from one era to another occurred. How did the rambunctious disorder and ribaldry of Georgian times turn into the moralistic earnestness of Victorian times? How did this affect the way that people thought? I had hoped that Altick’s Victorian People and Ideas or David Robert’s Paternalism in early Victorian England might have helped me, but if you read my reviews of them, you’ll see that I’m still gnawing away at the question. 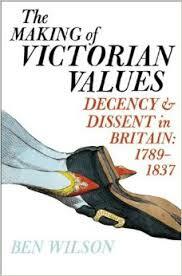 Which brings me to Ben Wilson’s The Making of Victorian Values: Decency and Dissent in Britain 1789-1837, or as it is titled in the United States Decency and Disorder in the Age of Cant 1789-1837. Wilson is heir to the great radical historians of the twentieth century, E. J. Hobsbawm and E. P. Thompson among them. He brushes aside scholarly politesse, refuses to join in unnecessary academic point settling, and possesses the sort of rare and invigorating literary gifts that bring to mind less the titles of other histories than the great works of nineteenth-century British fiction. ‘The Making of Victorian Values’ marks the arrival onto the American stage of a historian whose precocious talents cast a very long shadow. The American version of the book has been reviewed in the English press in particular [see Nicholas Shakespeare’s review in The Telegraph, Jenny Uglow in the Financial Times and Virginia Rounding in The Guardian ]. Although Google Scholar records that it has been cited fairly heavily, beyond a journal about Byron, I have not been able to find any academic reviews of the book at all. I did, however, find this article which raises a question mark over academic acknowledgments- an interesting observation on the “unnecessary academic point scoring” comment on the dustjacket. I must confess that, while I enjoyed the ride, I found it difficult to detect the argument. The book is stuffed full with anecdotes and examples, but the lines of his argument are harder to detect, despite his clear enunciation of it in the preface and the final chapter. He chooses as his period of analysis 1789- the start of the French Revolution and 1837, which I assume (although he doesn’t state this) is the ascension of Queen Victoria to the throne. 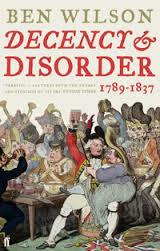 The book is structured into three parts: Hypochondria 1789-1815; The Arts of Peace 1815-1821 and Rich and Respectable 1821-1837. Part II in the American version has been extended. Part of my problem in detecting the argument could lie in the over-larding of introductions and prefaces. The book begins with a preface: ‘Moral Rearmament’. Then follows a prologue: ‘Untaught feelings’. Part One is announced, followed by an introduction to Part One ‘Some New World’. Finally, after 43 pages, we begin. Parts II and III likewise arrive, trumpeted in with an introduction. He makes much of Byron’s denunciation of ‘the age of cant’ and yet, as he himself admits that commentators had been deriding cant and hypocrisy long before the period he has chosen, and they were still doing the same thing at the end of the book as well. And here arises my second problem : his heavy reliance on literary and political commentators as his source material. While much can be learned about a society talking about itself (I think, in our current context of, for example, the shelf of Australian non-fiction books at Readings bookshop) , how closely does it intersect with lived experience beyond the commentariat? (I think, for example, of Olympic Village Shopping Centre where my husband was on the Labor Party stall last Saturday). I felt rather overwhelmed by the mass of detail, and obviously other readers have felt the same way too (see this excellent and very enthusiastic review on Vulpes Libris). I found it useful to devise my own bare-bone structure diagram, to see how the argument proceeded. When I saw the book laid out this way, I could see more easily what he is doing. In Part One he introduces us to three key characters who represent the change in the mentality he is describing: John Bowles, who fears that the French Revolution will infect the lower classes; Patrick Colquhoun who sees vice in every corner and was instrumental in the establishment of the Society for the Suppression of Vice, and Francis Place, a working-class writer who prized the resilience and innate goodness of the working man. He takes us to meet them in turn- a technique that I really like- and he revisits them throughout the book. Then there is the chorus of other voices: Hazlitt, Byron, Robert Southey, William Wilberforce. He then moves on to two chapters describing upper class behaviours that ran exactly counter to what was being prescribed for the lower classes by looking at first upper class divorce, and then upper class clubs. I can see now that he is juxtaposing the fears about disorder (hypochondria) with the excesses of upper class society which is perfectly happy to indulge in that disorder at will. He brings these two themes together in Chapter 7 where he describes the clash of these two mentalities over the renovations to the Covent Garden theatre. I can see that in Part II he is playing off two parliamentary committees against each other: the Mendicity committee which blamed the poor themselves, and the Committee for Policing which cautioned leniency given the structural imposition of poverty onto individuals. And I can see that in Part III he spells out how the mindset behind the Committee on Mendicity ‘won’, and that armed with the Vagrancy Act and new policing powers, the street life of Britain was stamped out and a new order of morality and stringency introduced. The nub of the argument comes in Chapters 11 and 12 which I felt, run as a corollary (as the dustjacket suggested) to E.P Thompson’s Whigs and Hunters. In Whigs and Hunters, Thompson describes the change in capital sentencing where transportation replaced the death penalty for property crimes, but in this chapter Wilson shows the knock-on effects further down the crime network. Because people no longer needed to fear that mounting a private prosecution for a fairly minor theft might end in the death penalty, more crimes were reported; and because prison conditions became more ‘effective’, magistrates were more likely to sentence children to jail. The Vagrancy Act, so heavily influenced by the Committee on Mendicity, is fundamental to the change in English life. Meanwhile the self-flagellation over hypocrisy and cant continued unabated, but by 1837, it no longer mattered. A nervous people was soothed by these legislative controls and moral strictures, and if it was hypocritical, at least there was some progress and improvement as well. It was a collective decision to accept the term ‘cant’ for what was portrayed as a better good. I like this argument, and it works for me. I can see parallels everywhere in Abbott’s Australia: the binaries between ‘lifters and leaners’, the Government’s attempt to shield our eyes from the ugliness of our refugee policy ‘for our own good’. So worth reading? Definitely, just for the sheer exuberance. Each chapter, in itself, was engaging and lively, centred around an episode or event and genuinely enjoyable in its own right. My qualms? That the details – vivid and memorable though they were- obscured the argument so much that it was not so much revealed as superimposed in the conclusion, lest you missed it along the way.For my own purposes? yes- it’s an argument that works. It’s all there in Chapter 11 and 12. And while I very much enjoyed the ride to get to that final destination, perhaps a bit more sign-posting that I’d actually arrived might have been useful. This entry was posted in Book reviews, History writing, Nineteenth Century British History. Bookmark the permalink.